Pam Flowers has always been kind of a loner. After finding herself in Texas, working at a career she didn’t particularly enjoy, she remembered her dream of one day moving to a “snowy vastness” and having adventures. She decided to quit her job and move to Alaska. She found work at the Howling Dog Farm and learned how to raise and train sled dogs. 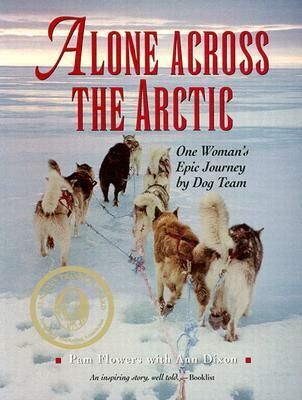 She took up dog breeding and mushing and competed in the Iditarod. During this time she also began planning her own expedition – she wanted to retrace the steps of Knud Rasmussen and his Inuit companions who traveled 2500 miles by dog sled along the North American Arctic coast. This is the story of that expedition. After reading this you’ll have a better sense of just how much work it is to train a team of dogs to pull you and all your stuff 2500 miles. Pam had to organize drops of supplies all along the route so that she and her dogs would have food and fuel and other things. The weather was often terrible, the terrain was often rough, the sled got stuck a lot, and the dogs could be unpredictable. Pam was alone for much of the journey – except for the stops she made in towns and at tiny isolated outposts along the way – and sometimes it was hard for her. The expedition nearly failed when warmer than average temperatures stranded Pam and her dogs on an island. Her lead dog was deathly ill, and she was able to telephone for help from a station on the island. She then spent the summer months in a small village, waiting for the ice to reform, before she could continue her journey. Pam’s story is full of excitement as well as information and includes some beautiful photographs of the Arctic coast (and her dogs!). For those who enjoy true adventure stories, cold climes, and close calls! The book was fine, but it wasn't a page turner. I wouldn't read it again. It took me a month and a half to finish it and it's a really short book. The story line is interesting, but I just found that the author included a lot of details that I didn't care about and then skimmed over ones that might have been interesting. I have to admit that the parts I didn't care too much for where the ones where she went into details on the dogs. I guess that's because I'm not a dog lover. She spent a whole summer with the natives in northern Canada and tells about it all in two pages. I'm sure there was a lot more to tell than two pages worth of information.